This week, I had a wonderful conversation with our dear friend, Christopher Bamford. I say our friend, because Christopher is one of those rare people who can inspire you through words on a page. Long before I came to work with SteinerBooks, I read his introductions to books as if I had this great teacher sitting in front of me introducing me to the material. This week, I am sharing a bit of our chat with all of you with his blessing. Our conversation veered in a new direction as I asked him how he was feeling. For those who are not aware, our dear friend is in a treatment regimen for cancer. He described a space between understanding and beginning. The time that you are aware of a new protocol and beginning it. I shared with him the story of my father’s cancer journey, or at least the part of that journey I experienced. We talked about the many faces of our biographies and how we share only parts of those with those in our lives. The cancer patient versus the writer, the cancer patient versus the father. We spoke about my sharing books with my father over the years and how that selection changed when he was fighting and healing. I remember wondering what waiting books are best to share. The waiting books as I call them to help you pass the time, but also can become a tool in your own recovery and acceptance. Chris told me that he was rereading Rudolf Steiner’s Autobiography, and with each new reading, he gained a new lesson. The chapters in the course of all of our lives give us a new perspective on life’s experiences and a panoramic view of the activities that led us here. It is in times of challenge that we turn to the observational practice of looking back at events and remembering them from a sensory perspective instead of the actual image. As I look back at the trading of books with my father, it is the emotions that these memories evoke that are housed in my mind. Chris shared that we can all learn about our lives through the lens of another's biography. It is this type of book that can bring meaning to our journey through the lens of another. Our biography is our most precious, intimate possession, yet how much do we really know about ourselves? With a little work, we can discover in the unfolding of our biography the traces of a marvelous, cosmic patterning—the cycles of our life. The thirty-year cycle marks a major turning point in life. 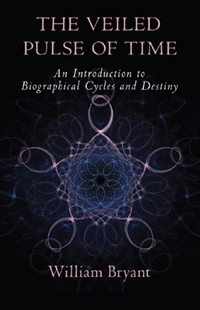 The Veiled Pulse of Time explores these cycles and discusses questions of freedom and destiny, transformation, reincarnation, and karma. Laurence Oliphant is one of the great unknown personalities of the nineteenth century, and indeed of recent cultural history at large. He was born at Cape Town in 1829 and died near London in 1888. He left behind some twenty books, including novels, travel accounts, and mystical spiritual writings. He was diplomat, traveler, adventurer, writer, and mystic. At the beginning of the 1860s, the period of Oliphant’s great spiritual transition began when he met the Swedenborgian Thomas Lake Harris. It was Oliphant's last works, Sympneumata and Scientific Religion, that prompted Rudolf Steiner to pursue karmic research on Oliphant. As a result, Steiner revealed the karmic relationship between the lives of Oliphant and the Roman poet Ovid. In an August 24, 1924, lecture in London, Steiner commented that Oliphant’s individuality is significant not only because of the previous Ovid incarnation, but also because of its activity in the interval between the two incarnations. Looked at in the light of spiritual research on the subject, Oliphant’s life assumes dimensions of world-historical interest. When Ed Entin decided to torch his draft card, everything about his life changed. He had his whole life mapped out. It was 1966 and Eddie had just been accepted into Yale Law School—his ticket out of the Army and Vietnam and into a life of secure prosperity. It took only one day, one decision to change the course of his life. What follows is a sometimes harrowing, often hilarious, and always illuminating ten-year journey through the social, political, and spiritual turmoil of the era. For anyone wondering how it was back then—or how to get through right now—Living on the Fringe provides a look at how one person waded into the turbulent waters of his time and came out whole, dry, and ready to face the future. And with a new name to match the person he had become.